Few trials in life challenge our faith like the death of a loved one. The sudden death of a spouse forces a radical re-orientation of daily routines, identity, and plans for the future. The death of a child is even more shocking as we contemplate all that could have been. The death of a dear friend leaves a hole in our lives that isn’t easy to fill. Such experiences clearly justify the apostle Paul’s chilling description of life in the fallen world as being under “death’s reign” (Rom. 5). Death’s reign can cast a long, dark, and even blinding shadow over the lives of grievers. How do we possibly make sense of the loss and all the changes it thrusts into our lives? How do we dare to hope when nothing about the future is recognizable any longer? 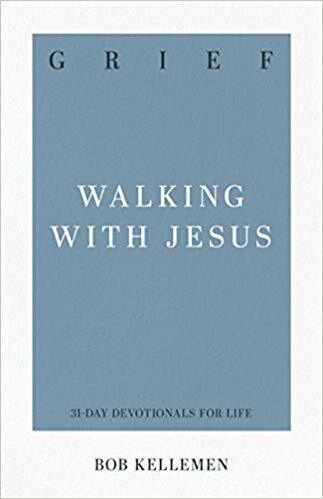 Bob Kellemen dares to tackle these questions in Grief: Walking with Jesus. As part of P&R’s 31-Day Devotionals for Life series, Grief consists of 31 two-page reflections on what it means to process grief from a Christ-centered perspective. Kellemen structures these meditations by walking readers through the life of Christ from the Gospels. From Jesus’ “birth into a broken world, to death at the hands of a sinful world, and everywhere in between, the Gospels guide us on a grief journey with Jesus” (p. 10). Consequently, “not only is Jesus acquainted with your grief, he is always with you in your grief” (p. 10).